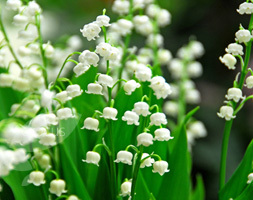 Ever popular, lily-of-the-valley is an excellent groundcover plant for moist, humus-rich areas of the garden, quickly spreading to form a fragrant carpet of pure white, bell-shaped flowers and long, dark green leaves. The plant flourishes in sun or partial shade, and the diminutive, bell-like flowers are traditionally an important part of spring wedding bouquets. The seeds may cause a mild stomach upset if ingested.